California's remarkable Yosemite National Park has picture-perfect weather throughout much of the year. Visitors will usually find bright and sunny days with nights that are cool and crisp. 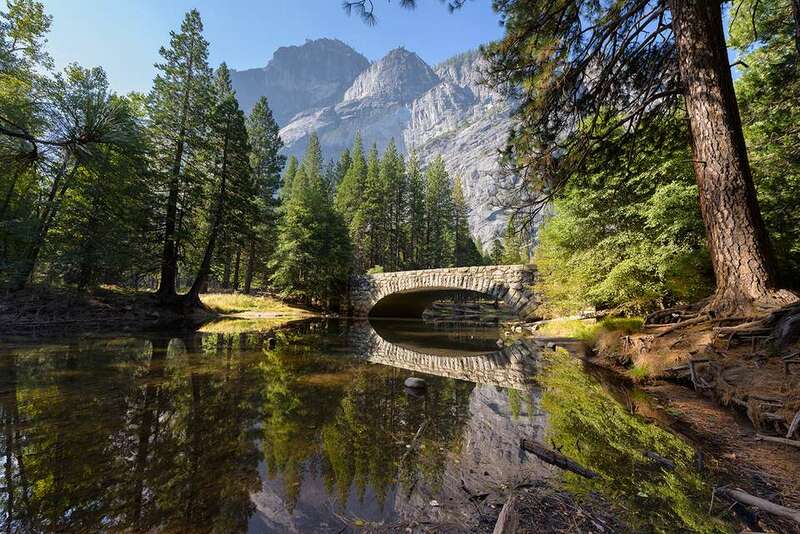 Spring and summer in Yosemite are usually dry (although a late spring snow storm is not unheard of), making both seasons ideal for outdoor activities and park exploration. However, summertime in Yosemite can also be extremely crowded—it's not uncommon for traffic jams to cause delays throughout the park. Fall and winter are cooler with fewer crowds. February is typically the wettest month, but temperatures in the park rarely drop below freezing for extended periods of time. Spring weather in Yosemite is typically mild, but that doesn't mean that rain or even late-season snow isn't possible. Ski areas usually close by March 31, and some roads in the park might still be closed due to winter snow. You can expect blooming wildflowers and running waterfalls during the spring months. Tioga Pass usually reopens in late spring, which makes traversing the park much easier. What to Pack: If you go in spring and want to hike near the waterfalls, they are flowing fast that time of year. You may want to bring an umbrella or rain jacket with a hood to keep yourself dry in the spray. You should also carry tire chains, even if you have four-wheel drive, as some roads are still unpassable. Summer is the most popular time of year to visit the park. Weather is typically warm, if not downright hot, and the park can be extremely crowded. It does rain once in a while during the summer, and you should be prepared for thunderstorms, especially in the higher elevations. If you get caught in one, don't risk turning into a human lightning rod. Avoid exposed places and metal railings at vista points—and don't take shelter under lone trees. If all else fails, lay down flat on the ground. It may not be dignified, but it's safe. What to Pack: Strong sunscreen is a good idea, higher SPF than you might use at home. Thinner air at higher elevation means more UV rays get to your skin and you will burn faster. Pack another extra layer if you plan to go to higher elevations. Temperatures are much cooler up there. Autumn is one of the nicest times to visit the park, as temperatures are milder, making outdoor activities like hiking much more enjoyable than during the heat of the summer. Fall is peak season for trout fishing and Leonid meteor showers. If you're hoping to catch fall foliage, it will be visible only at certain areas in the park as many trees are evergreen. Tioga Pass closes when the first snowfall happens, which usually takes place by mid-October or mid-November. Otherwise, fall is quite dry—there's typically very little precipitation before November. What to Pack: Pack layers and be prepared for many different types of weather. In early fall, daytime temperatures can still be quite warm—like summer—but by November, you'll need sweaters and a solid coat, especially at night or at the higher elevations. Winter is a beautiful season in Yosemite. While it does snow in the valley (it is at 4,000 feet), it often won't stay very long and many days are sunny. You can downhill ski or snowboard at Badger Pass, whereas cross-country skiers can take longer trips to Glacier Point. Many roads will be closed as snow makes passing them impossible during the winter months, but waterfalls are usually flowing making winter a great mix of Yosemite's best features. What to Pack: You'll want to pack clothes that will keep you warm and dry during Yosemite's unpredictable winter. Pack warm base layers that you can top with cheap fleece jackets or pullovers and a waterproof jacket on top of that. As always, good socks and waterproof shoes are a must. Tennis shoes will be OK in some parts of the park, but if it's wet, it's better to have footwear with more traction.